Trim and peel the beets and turnips. Quarter the beets and place in a roasting dish. Add enough olive oil to coat, and sprinkle with salt and pepper. Quarter the turnip (notice I left a little of the stem on as this caramelizes and tastes yummy) and place in a separate roasting pan. Coat with olive oil and sprinkle with salt and pepper. Cover both with foil and place in a 375 degree oven. Roast until tender. Beets will take about 25 minutes and the turnip was close to an hour. Remove the beets from the oven (leave them in the baking dish with the cooking juices) and sprinkle with 2 tsp of balsamic vinegar. Allow them to sit for several hours. After you have cooked the turnip until tender (fork inserts easily), remove the foil and turn the oven up to 400 degrees. Roast until they just start to turn golden brown. Remove from the oven and allow them to sit in the roasting pan for several hours (in the cooking juices). To serve, place a bed of lettuce on a serving platter and arrange the turnip on one side and the beets on the other. 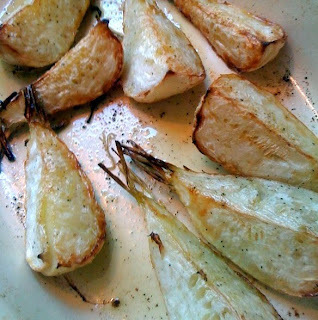 Take a tbsp of olive oil and add to the pan you cooked the turnip in and mix well. This will combine with the oil from the cooked turnip giving it a delicious flavor. Drizzle this over the turnip. Add a tsp of olive oil and 1/2 tsp of red wine vinegar to the liquid in the pan from the beets. Mix and drizzle this over the beets. Sprinkle both the turnip and beets with crumbled goat cheese before serving. Cook 6-7 ears of corn. About 5 minutes in boiling water. Cut the corn off the cob. 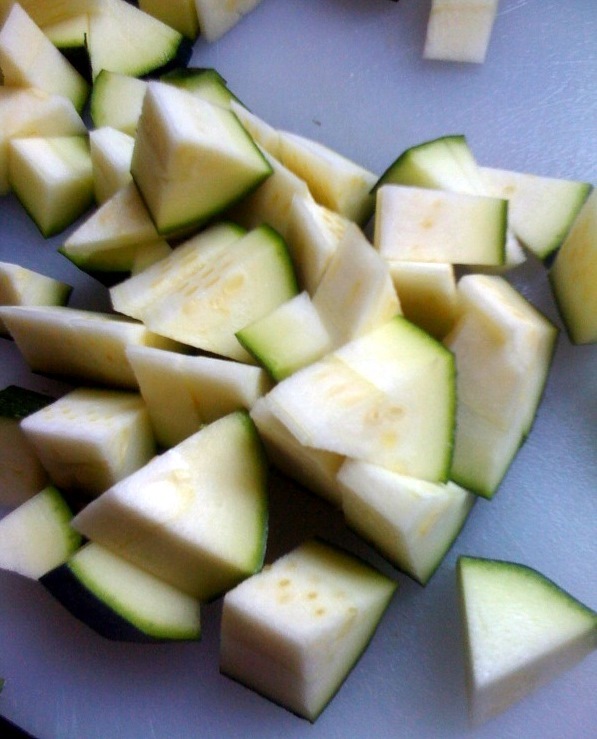 Lightly coat the zucchini with olive oil and sprinkle with salt and pepper. Roast in a 400 degree oven for about 15 minutes, or until just tender. Remove from oven and allow to cool. 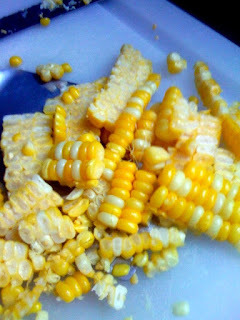 Then add the zucchini and corn to a mixing bowl. Be sure to scrape the bottom of the roasting pan to get the extra olive oil which has that wonderful flavor from the roasted zucchini. Slice about a dozen cherry tomatoes in half lengthwise. Add to the salad and gently combine using a rubber spatula. This will prevent the zucchini from breaking up. Add a tsp of seasoned rice vinegar, a tsp of red wine vinegar, and salt and pepper, to taste. Allow to sit at room temperature for a few hours before serving. You can make this ahead of time and refrigerate just be sure to bring it up to room temperature before serving, as it will taste much better. You may need to add a little bit more vinegar to bring out the flavor. You can find my pesto recipe here. Cook a good quality cheese tortellini (I used whole wheat three cheese from Buitoni) until tender. Drain and reserve about 3-4 tbsp of the pasta water. Add this back to the tortellini and toss with a generous amount of pesto sauce so that the pasta is well coated. Place in a serving platter and sprinkle with your favorite grated cheese (mine is Pecorino Romano). The salads made for a wonderful light summer dinner on very hot evening. The cake was delish, too.